Heroes Unleashed pushes tactical realism gameplay to the extreme, setting it light years apart from anything you are accustomed to in today’s ubiquitous action shooters. One shot can kill. There is no magical healing, fantasy gear, sci-fi enemy markers, handholding, or guide towards certain victory. It is just you and your squad, on your own behind enemy lines, with caution as your best bet to survive. To support Heroes Unleashed, share it, and recommend it to other people. If you want to contribute more, leave a donation. Thank you. It is hugely appreciated. Alright iv looked through some stuff and have found what i needed. Hey it would be really awesome if a couple of you guys would post some Heroes Unleashed gameplay clips on youtube. Hey ApexMods is there any chance that you could add a free roam ghost camera like the ghost camera in Rainbow Six 3 Raven Shield? Sorry, unfortunately this is impossible to mod due to GR's hard-coded perspectives. There is a 'spectator' mode in GR that you can access when your game character dies which lets you follow any of your remaining teammates in 1st or 3rd person view, though. Nice mod, freakin' nice mod. Hello I love this game, but can you say me why in the campaign when I finish island thunder part (mission 31 in heroes unleashed) i can't continue in the mission 32? The other 120 maps are only quick missions? Way cool! Everything works great and its amazing how beautiful the maps (even the old original ones), weapons, actors, UI etc. look in this mod. It feels like a new game! Weapons character, reticles and sounds are very good too. And I love the added gametypes like SAR, random and XL. Lots of enemies to fight in lots of ways on lots of new maps with lots of new weapons. We play this mod on our LAN all the time with random maps and random gametype and it never gets old. Finally I can play a female character in multiplayer (yes, girls play Ghost Recon too!) Many thanks for the work put into this! What's all this about updates? I'm a beginner when it comes to GR mods. Thanks in advance for any replies. The updates indicate that this mod is still under active development with new features being added in each release. Although it's still in beta stage it seems to be fully playable and is already pretty awesome. Over 200 (well-balanced) weapons, 150 (gorgeous) maps, and too many other enhancements to list here. Keep it coming, guys! 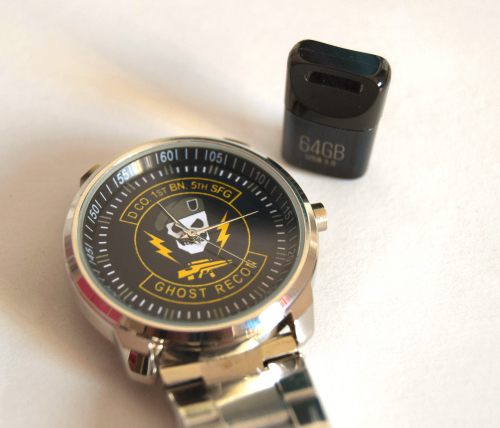 Ghost Recon forever! Save us from the GRAW and Future Soldier crap! It's a really good mod. Awesome overall. The weapons are all well made and scaled perfectly to the charchters. Huge collection of weapons as well. I just have a few issues. The medals that charachters earn are gone. I loved them. You can't use other weapon changing mods with it . Some weapons dont have a lot of options. I wanted a full auto ACOG M16 with a rocket launcher, but I can't. Excellent mod! Thank you very much! I have completed all the 15 mission on compaign, but when i start the 16th mission, it just crashed to desktop.. help me.. Sounds like you don't have the Desert Siege expansion installed/activated. The mod requires both Desert Siege and Island Thunder to be installed and activated. Taken a great game and actually improved it. We've only played the first few missions so far but have only seen improvements, nothing actually made worse by supposed improvements. One of the only games/mods I've ever seen where shotguns are represtented decently for their actual real world spread/range etc - they're actually useful at more than 5ft from the target. We were concerned that the new draw distance etc would adversely effect the swamp-it didn't. Honestly nothing but praise for the work done here.Really looking forward to the further updates and so on. A couple of questions if I may:Any chance of working with the Frostbite chap/s to add that mod into the new views etc (as that is one of the mods which seems to really hold to the spirit of the original while still offering something different)? Is there any plan to add more missions (on the new maps) to this mod? @Inncubus Thank you very much for the nice words. Seeing appreciation like this certainly motivates me to keep working on Heroes Unleashed. To answer your questions: A future Frostbite add-on is a possibility, but I still have so much unfinished work for Heroes Unleashed that this probably won't make it to the top of my to-do list anytime soon. To play the Frostbite campaign on the reworked maps etc. would probably require mission script adjustments, e.g. due to the changed spotting distances/visibility of enemies etc. Then there's weapon replacement and balancing, implementing winter camo, and so on and so forth. It is definitely doable, but requires time which I simply don't have enough of at the moment. As for your second question: Yes, there will be more (new) missions at some point in the future, but I still have to finish re-scripting the original campaigns and there's a boatload of other work I have to finish first. This is an amazing package here, thanks! BTW - Looks like ModDB has some serious problems with their site today. Everything is offline at the moment and that includes the download section, so Heroes Unleashed downloads are currently inaccessible. Sorry for the inconvenience. You not possible the version French for Heroes Unleashed ? This mod is packed full of features and has great potential. However, the friendly AI appears to be "dumber" than it was before the mod. When they see an enemy, whether it is close or far, they don't even bother to shoot. This appears to occur more when the enemy is far, the friendly sees the enemy but justs points his weapon at him. Changing the ROE doesn't do anything, unlike the original. My guess is that since the maps lack fog, the Ghost's can only engage at a certain distance? Apex you made a great mod and even is my favorite on GR.NET, but please take note of the AI problem. This isn't the first complaint on the AI. @SuperCriquet: Sorry, I don't have the time to create separate language versions of the mod, as that would mean a LOT of extra work, and development is already slow due to RL obligations. @Friendly AI Problems: I guess you posted about this at HeroesUnleashed.net, too? As I said over there, this issue might be caused by a missing update patch for GR itself. I certainly don't have this problem on my installation, and none of the people I asked reported this issue on their end, either. @ApexMods I think you got the wrong person, I didn't post on HeroesUnleashed.net. I have done a reinstall with all the expansions as well, patched to 1.4. I even went as far to try different versions, D2D, and Hardcopy. I mean sometimes the AI does their job, sometimes they don't. Nothing is perfect I guess. @Friendly AI problems: Well, most AI in games is prone to occasional erratic behavior, e.g. enemies in ArmA2 quite often provide unintended comedy, but I think GR's AI is doing a really good job overall, i.e. with realistic flanking maneuvers and proper use of natural cover. The AI in Heroes Unleashed (both friendly and hostile) has been optimized for additional capabilities (given additional clock cycles in the simulation tasking via actor stats) to improve their awareness of and reaction to enemies, as well as better general autonomy. The increased clipping distance and decreased fog (it's still there, just a lot more realistic) doesn't influence AI behavior except for earlier/further enemy detection. I repeatedly see very nice prolonged firefights between friendly and hostile AI in long-distance engagements on large maps in Heroes Unleashed. Excellent Mod! Thank you for all of the effort you put into this. Excellent mod, thanks a million! When I switch my personal computer on it says that I'm infected and won't let me close as well as open something. What can I actually do? and what does this have to do with ghost recon mods?!? If WinZip gives you trouble I suggest you try the original 7-zip (free / open-source) to extract the archive. With 7-zip installed just right click on the first of the parts / the full install and select "Extract Here". Is there a patch from b6 to b7? Or should I just download the full b8? I love this mod, KEEP GOING :D!! I would really like to see a Ghost Recon Xbox HUD/UI interface also excluding the Charlie team so it only leaves Alpha and Bravo, 3 men per team and a command map like the Xbox version would be amazing! If you could do that, please do it! I need some help,after I installed the mod,GR is crashing now about 5 cesonds after I enter the command map,please help. hey guys sorry to ask a dumb question but the threat indicators doesnt seem to appear on the hud even tho its enabled in the options, any ideas?